The Theatre Antique in Arles, France in Europe is a historic Roman theatre that has seating for approximately 10,000 people. The seating area at the Theatre Antique in the city of Arles in the Provence, France has been modernized since the first century and is still used today for concerts and festivals. The seating area can accommodate up to 10,000 people and is an ideal location to watch outdoor events under the brilliant blue sky of Arles, France.Only a few of the the pillars and columns that were originally part of the structure remain standing and the rest have been destroyed. A tour through the Theatre Antique is extremely interesting and full of historical discoveries.Seating area in the Theatre Antique in the city of Arles, Bouches du Rhone, Provence, France, Europe. 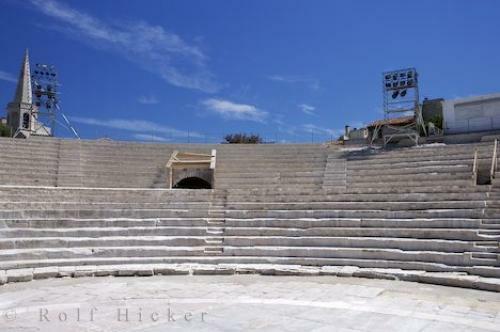 Photo of the seating at the Theatre Antique in Arles, France in Europe.